(2) Side pockets for merchant and guest bill copies. 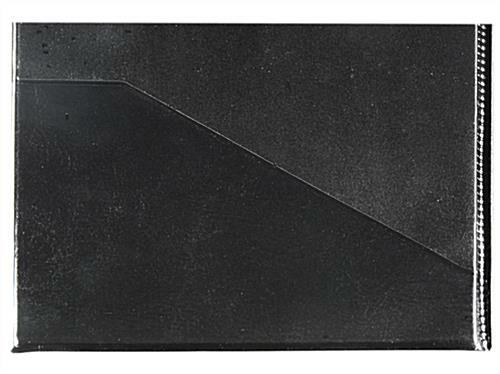 (1) Top pocket for credit card access. 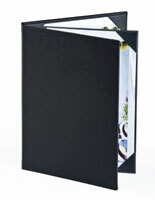 5-1/2”w x 10”h To accommodate receipts and credit cards. 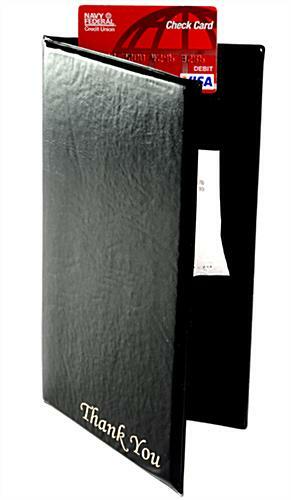 Front and back padding for durability. 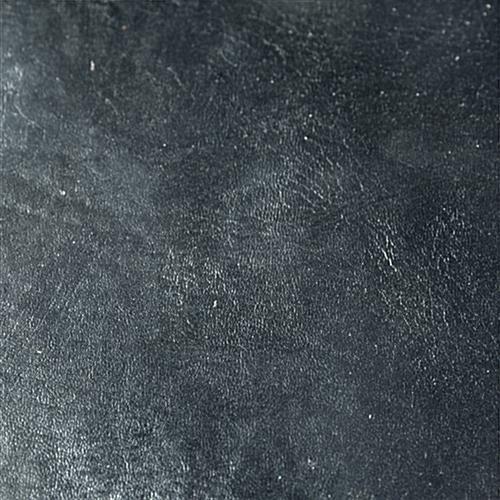 Black leatherette finish for style and affordability. “Thank You” inscription for a gratuitous gesture. 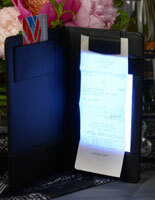 This restaurant check holder, called a bill presenter, is a sophisticated way to present a guest with a receipt. 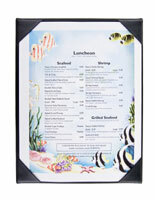 Using receipt covers is an economical way to improve employee exchange with customers in dining locales. 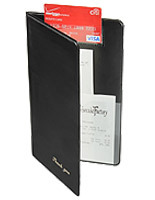 This bill presenter, restaurant check holder is a popular product for foodservice venues. Being the last item your guest will see before leaving the venue, it is important to leave patrons with a good impression. This restaurant check holder for a dinner tab does just that. 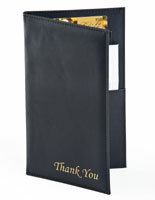 Inscribed on the outside front of the presenter is “Thank You” for a unique and personal element to this product. 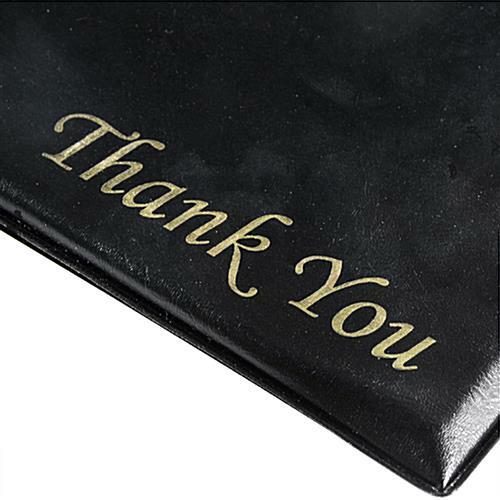 This restaurant check holder that has thank you inscribed on the front is a great way to make a customer feel appreciated. 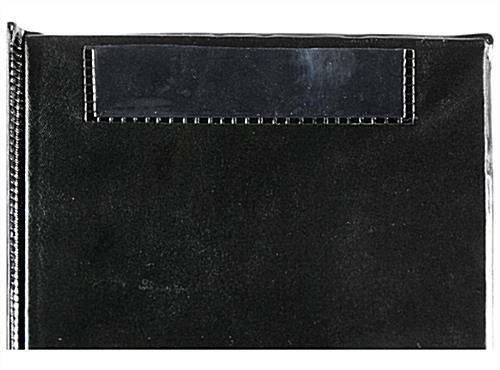 This bill presenter is made of faux leather which conveys the same look as genuine leather for only a fraction of the price. 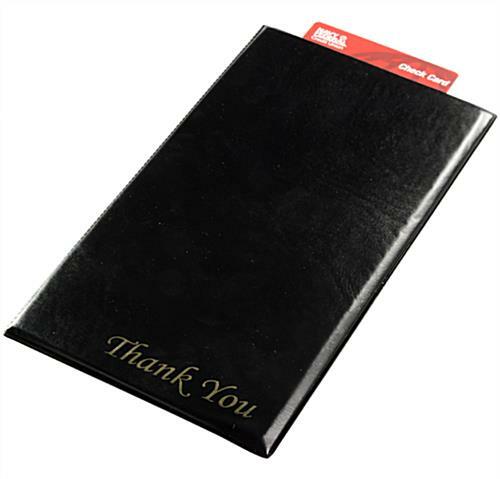 This black leather restaurant check holder has soft padding on the front and back which gives this display a polished feel. 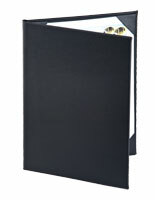 Complete with three pockets, this statement enclosure keeps bills organized. 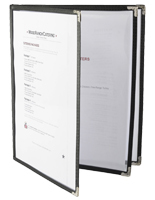 Inside of this restaurant check holder that is for dining patrons are two side pockets to keep a merchant’s copy and customer copy separated, as well as to hold cash. 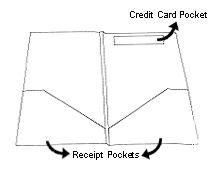 The third pocket on top is the average size for gift cards, credit cards, or diner’s club cards. This restaurant check holder provides an organized book for guest currency. The design of this bar bill presenter makes the process of checking a guest out much quicker for wait staff. 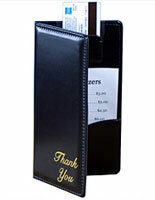 This restaurant check holder that is for guest payouts is commonly used in most foodservice venues. Shop for bill presenters today! 5.5" x 14.5" x 0.5"
It was bigger than I thought. Everything is good but only the size is little bigger than I thought. It is hard to carry several of them in an apron due to the size. Only one fit in the apron in the restaurant. Hi HeeJu, Thank you for your review. These check presenters are very basic and appear pretty cheap. I would not use these at anything more than a fast-casual type operation. Hi Daniel, We are sorry to hear you are not pleased with these check presenters. If there are any issues with them please contact the customer care center directly.